The episode started with Nathalia telling our host Rohit Shetty that he is too mean, khadoos and khatarnak. Later Rohit Shetty acts like a boss and gets two names - Ashish and Hussain playing a prank on him. This wasn't too light for him and he started giving them punishments for their acts of play. 3 stunts were to perform today, out of which two were played by new contestants and one was the elimination stunt to be performed. This stunt was to be performed by Aashish Chaudhary, Rakesh Kumar and Ridhi Dogra. According to this stunt participants will have to collect few flags from a pool of square area after which they will be transported completely upside down with a chopper helicopter to another place. They will have to unhook themselves and swim in the water with all the flags as many as they carry and reach the destination. Near a shore, there will be a box where they will need to put all the collected and transported flags which they haven't dropped as many of them. Rakesh performs the stunt first and was able to carry as many as 25 flags from the starting point. However few hiccups and drop downs cost 3 flags to him. He was finally able to transport 22 flags to his name. Ashish comes up next and does his best to carry 30 flags in one go. His harness cable was a bad luck to him which cost him dropping 4 flags there. On swimming he lost 2 more flags by dropping them. On reaching the destination, he finished with 24 flags to his name. Riddhi was third and started carrying 27 flags which was too many for her to handle. While being transported upside down by helicopter, she lost 2 flags in the process and while swimming she maintained an intact of keeping all of them without loosing any one. Therefore she finished with 25 flags to her name as Rakesh was called in for elimination stunt. Iqbal completes the stunt like a boss! Stunt was to be performed by Chang, Hussain and Iqbal. In this stunt contestants will have to drive a car to a high speed closing on 200 kmph and break two sheets of glass and climb up a running logistics truck which was running roughly at 150 kmph. They will have to stop the car to dead zero before a mirror placed on the truck inside. If mirror breaks, the stunt will be called off incomplete, so time and precision is more important in this stunt. Meiyang Chang goes first and starts off well. However he could stop his car before the mirror which he eventually breaks it. He was surely in danger now. Hussain goes second and completes the stunt without breaking the mirror and breaking it accurately. Now Iqbal had to do the same and did it comfortably without breaking the mirror and stopped his car way ahead of everyone. The result was clear to everyone now. The elimination stunt was "Cockroach Coffin" which is very clear to understand what it might be. Contestants will be locked up in a coffin box where they need to open 2 locks from inside having keys mixed with the cockroaches. Some 15k Madagascar cockroaches will be put inside the coffin with the contestants lying down. Their hands and legs will be tied and contestants will have to unlock their tied hands first to unlock the lock next. This stunt was to be performed by Rakesh Kumar, Harshad Arora, Meiyang Chang, Nathalia Kaur and Sagarika Ghatge in order. Everyone complete their stunts in order without much hesitation in a very quick succession of time. The one who completes the stunt with higher time was to be eliminated. Among all Harshad took the highest time and unfortunately he was eliminated upon sheer bad luck. Everyone was disappointed upon the first elimination! At the beginning of the episode, we saw some ghosts scaring our contestants in their living room, the place of residence. We then hear a grand welcome of host Rohit Shetty to the location of KKK. Rakesh Kumar tells a true story where he faced a paranormal activity in his village of residence. His shocks everyone standing there! Thereafter Asha Negi was asked to take a chit out from a human dead skull full of worms! This was ridiculous, but she did that finally and handed that over to Rohit Shetty. The chit has name in the order - Harshad Arora, Sana Khan and Rashami Desai. It was the hint for the upcoming stunt. Stunt No. 1 - "Shockeen"
The above three contestants were to perform this stunt in order. In this stunt, a bridge type structure was present some 10 feet above the ground. It was hanging above a pool of deep water which possessed something quite extraordinary. Yes, the bridge will have wires crisscross throughout its platform to make contestant's movement difficult. What's more difficult was the inclusion of electric shocks in the wire! Sounds weird? Yes this was exactly the situation among the contestants. They will have to collect few flags and also make sure they don't feel shocks while touching the wires in moving ahead. The flags will also possess high voltage shocks which made it even more difficult for fellow contestants to perform. First to go was Harshad, and he literally went out of the books in the entire stunt. He couldn't even take a single flag because of the high intensity of current which he felt time and again. Towards the end, he was finally able to collect one flag which gave him 5 points in his tally. Then came Sana Khan, who is known to create some funny acts and excuses gave her spine chilling performance. She initially faced fear, but later on went on to collect 3 flags that gave her 8 points to the tally. Rashami was third in the number and also performed well to get 3 flags and reached 8 points to move ahead, leaving Harshad in the danger zone for elimination stunt. Stunt No. 2 - "Buggy Ride"
For this stunt, Nathalia Kaur, Asha Negi and Archana Vijaya were selected to perform randomly. As the name suggests, Buggy means insects and worms, means totally related to fighting against worms! Contestants would be locked inside a box and they would have to open three locks whose keys will be inside the cage with them. A full flow of bugs and worms will be inside with these guys. What's more alarming, was that the box would be revolving, tilting all the ways throughout the stunt time. A very nerve racking stunt for these three girls. Nathalia went first and couldn't open a single lock and decided to quit after 4 minutes of time. Asha was next up, she faced a torrid time and was able to open 2 lock to secure herself in safe position. Archana was third and gave her performance opening 1 lock in a given stipulated time. Finally Nathalia came to the danger zone with Arshad. Stunt No. 3 - "Underwater Stunt"
This was to be performed by Ridhi Dogra, Siddharth Bhardwaj and Sagarika Ghatge. In this stunt, a contestant will be sitting on a sofa placed on a platform. There will be basketball type nets provided on two sides of the platform. The cutter will be provided and contestants will have to cut through the nets twice and come up with a flag to complete the stunt. All this would be done under water which is equally difficult. Sounds weird to perform right? Obviously this was a time based stunt and the quickest would be the deserving winner. 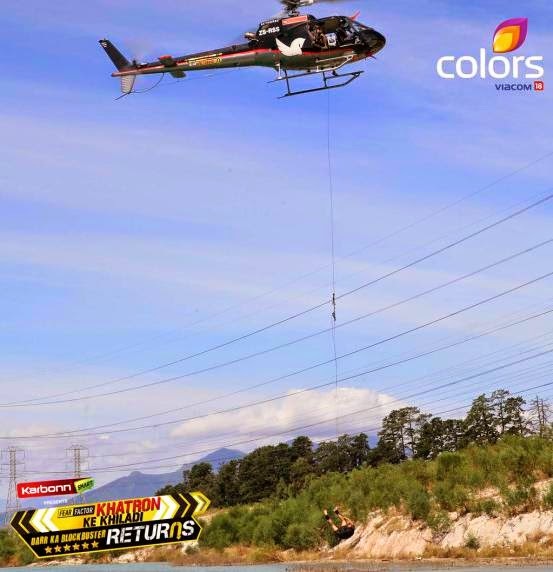 Siddharth and Ridhi did well to complete the stunt without facing any issues. The onus was on Sagarika who was going third and knew in how much time,she had to complete the stunt. This didn't pay off well for her. In the process of completing it quickly, she got stuck under water while crossing through the basketball type nets and was later rescued immediately from under water. She couldn't complete her stunt which took her straight to the elimination round stunt to be performed tomorrow. Thanks to providing these amazing stunt videos and information. Fear Factor khatron Ke Khiladi 8 started 22 July 2017 and airing on each Saturday-Sunday 9 PM on colors tv Channel. This time Contestants Set to stand the worry in Spain and going to be the following degree Stunts. 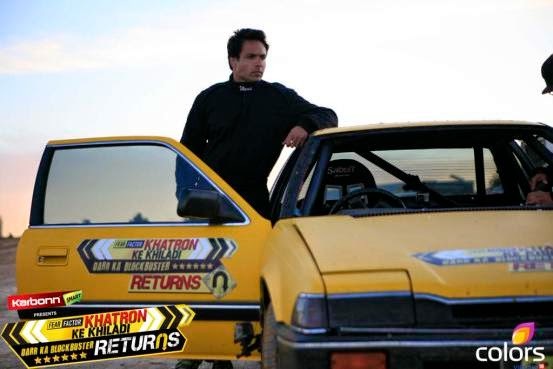 Khatron Ke Khiladi is an Indian stunt/dare reality game show.